So the last few days have been a bit of a whirlwind. Lots of baseball, lots of work, and lots of other life things thrown in the mix. I wound up at two games at the tail end of this week, both phenomenal wins. The first one was Thursday, as I am a sucker for reusable shopping bags, and even moreso for bags that are waterproof and emblazoned with well-done Seattle Mariners logos on them. Some people do the bobblehead thing, I like tiny trains, and other swag that serve utilitarian purposes. Plus, Su and Lisa and I have been threatening each other we’d get together at a game for like a year now, and Lisa was just recently engaged (congratulations again), so what better time than Girls Night Out? Thursday’s game was a cold one, threatening rain. 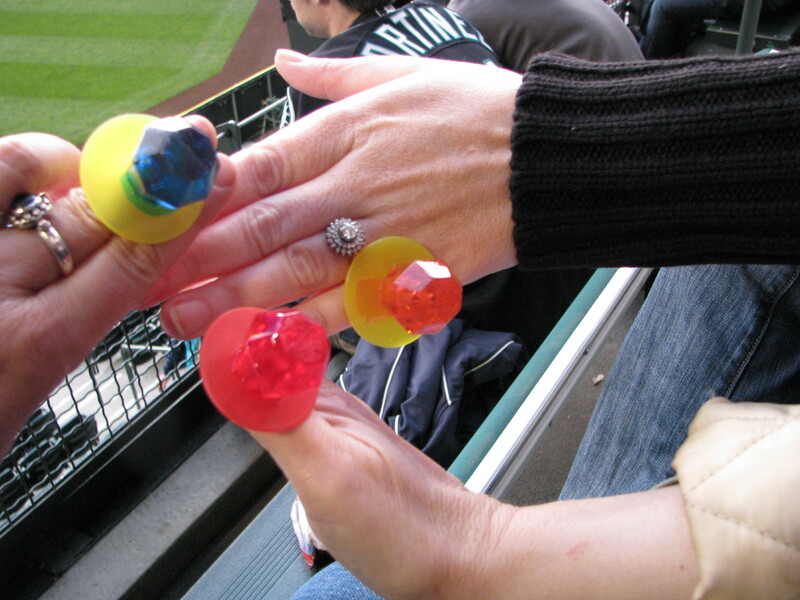 The three of us had dinner at the Flying Turtle, then wound our way up to the center field bleachers, where our seats were. 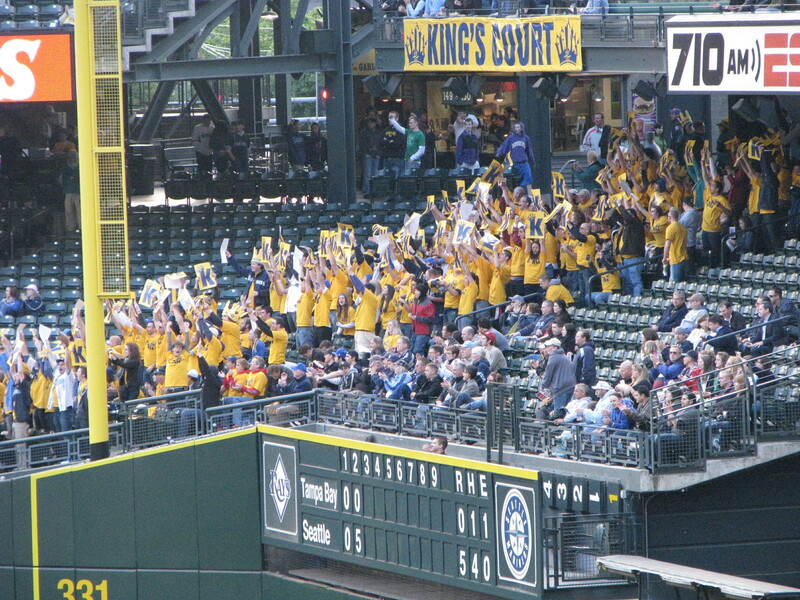 It was a Felix Hernandez start, and the King’s Court was in full effect. 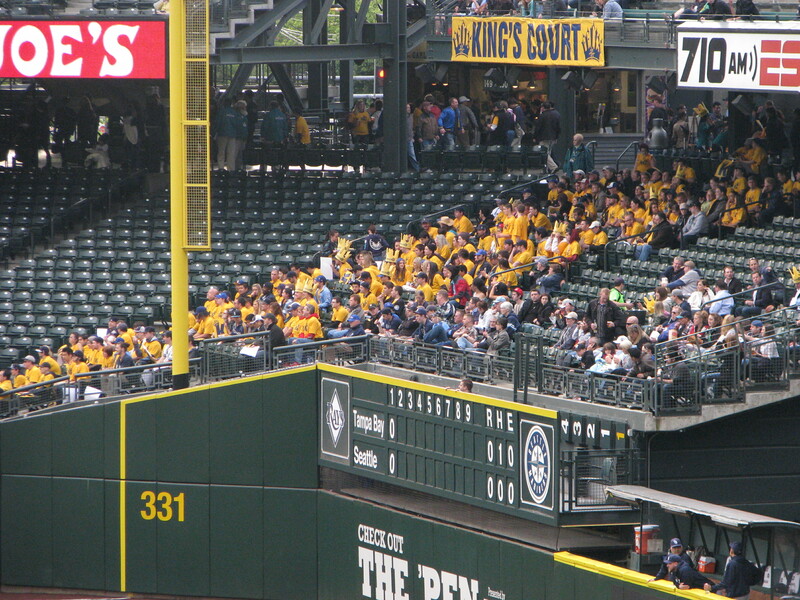 If you are unaware of the King’s Court (and I’d have to assume you might be living under a rock if you are), it’s over left field. Tickets are $30, and for that you get seats that normally run $55 or so, and a delightful (yes, that’s sarcasm) yellow t-shirt. I only say that sarcastically, because the color yellow and I are not on speaking terms. That said, I’ll be trying to get tickets for the section eventually this year, and yeah, I’ll wear the shirt. I believe you also receive a posterboard with the letter “K” on it. The section is sort of like a miniature version of the Emerald City Supporters, but without as much singing, and far less flag-waving or getting the rest of the crowd involved. It’s the closest thing we have, though, so I’ll take it. Rally pops! I’m not sure why blue translates to raspberry, but mine was delicious. Felix the King strikes out another victim, and the crowd goes wild. Fortunately, the Mariners did all their damage against James Shields early on in the game, but there were 4 home runs hit that night, which is rare by any team’s standards, but especially the Seattle Mariners. I was very cold that night due to a lack of foresight about a simple pair of socks and a possible thicker jacket, but I’ve never been so happy to be so cold in my life. The Mariners gave Felix run support, one of our young guys made good with two dingers, and even Jack Cust joined in the fun. Justin Smoak hit one over the fences, too, but I think most of us would agree that’s been par for the course for him this season. More later on yesterday’s game, I’ve got to run and take care of some errands with Tom before he leaves tomorrow morning. Still trying to figure out how I’m going to afford the entire Phillies series, AquaSox home opener tickets, and I’m sure there was some other baseball-related thing that I needed to do soon. June will be a busy month.